In Summer, on a hot and muggy day, what you probably want to do is water activities to escape the heat. 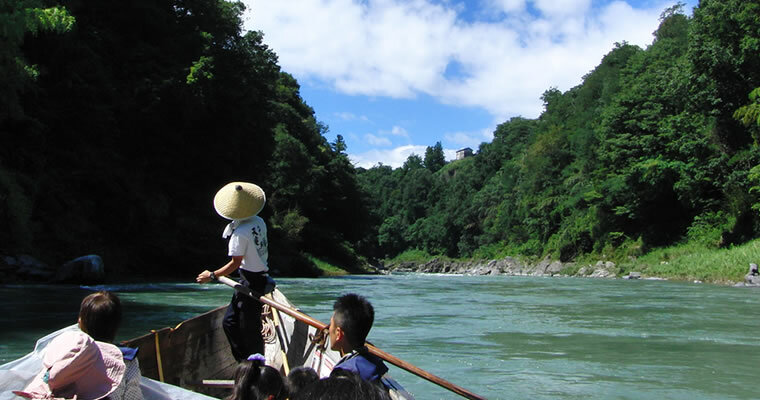 Rafting, Canyoning, and Kayaking.., there are many aquatic activities, though, if you want to try something different, something Japanese, how about Kawa-kudari boat tour? What’s Kawa Kudari Boat Tour? 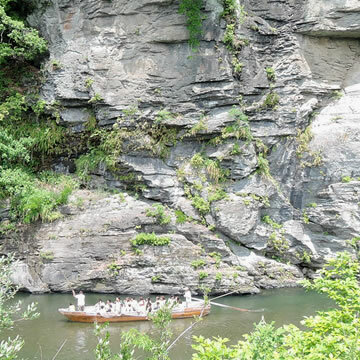 Kawa-kudari or River Travel is to ride a wooden boat and do sightseeing while going down a river, usually on a rough and calm stream between scenic valleys. 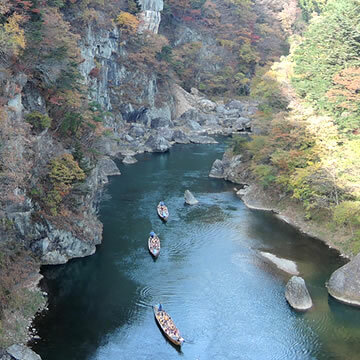 Kawa Kuudari is also called Line Kudari (pronounces lie Rine in Japanese), which derived from the sightseeing boat tour on the Rhine in Germany, known for the splendid views. So, Kawa-kudari and Line Kudari are the same, and Line Kudari is more commonly used. *Kawa-kudari is also called Funa-kudari, literally means "traveling downward by boat". 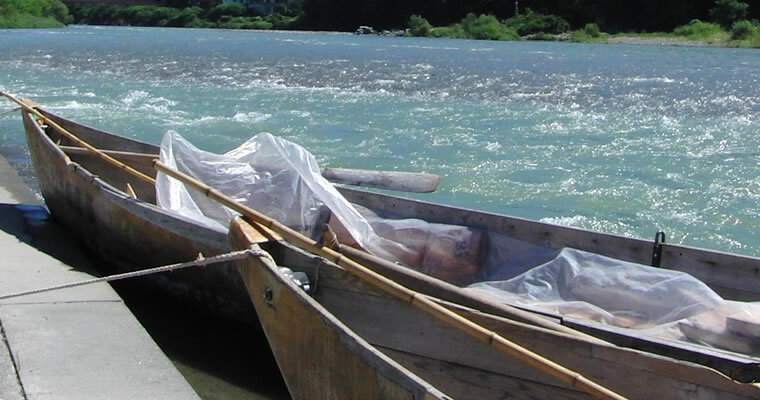 Kawa-kudari boat tours are served by professional boat-operating companies. 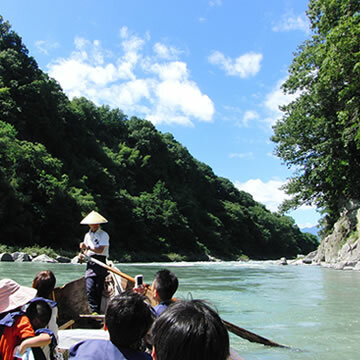 The tour begins from a boarding point (乗船場) on the riverside and goes down the river toward the end point (下船場),. During the tour, the customers enjoy both the exciting ride and the scenic view on the boat. The boat of Kawa-kudari has no engine, and they are all made of wood, that may get you feel thrilling in a different way from it of roller coasters. 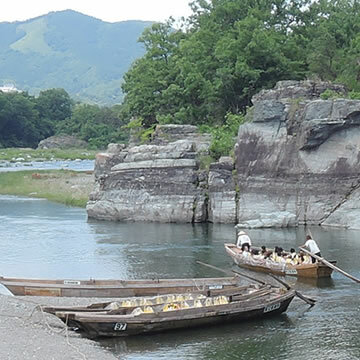 The boat-operator called “Sendo-san” skillfully uses a rod to manipulate the boat even in rough waves between rocks. Sendo-san also entertains customers with funny talks and singing on the boat. The Sendo-san sometimes sings Japanese folk songs at the point where the stream is serene, the nostalgic melodies echo through the valley in silence. Kawa-kudari tours are available throughout the year. Though the best season is in summer, it provides enjoyment seasonally; Bonsai-like trees with fresh leaves and flowers in spring, and rocky cliffs covered with snow in winter, when roofed boats with Kotatsu heater are often served. 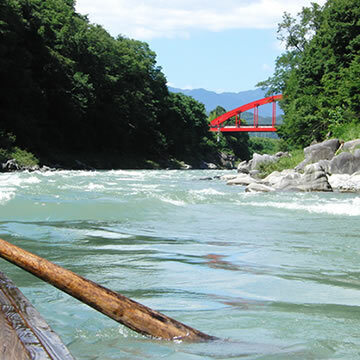 There are many boat tour sites at the river near famous sightseeing spots, and the Kawa-kudari operators offer several types of tours from thrilling to relaxing ones for both young and old. The tour duration is somewhere between 30 and 90 minutes, and the length of courses is 6km to 10km depending on the tour you join. Kawa-kudari operators provide safety measures and have well prepared for safety hazards. However, they don’t have supernatural powers to control the stream of the river that nobody can say it is 100% safe. Kawa-kudari boat-operators give safety advice when boarding, but it is usually done in Japanese. You should know about what Kawa-kudari is going like to be and the precautions. Under the life-jacket low, wearing a life jacket on a Kawa-kudari boat is obligated, whenever rain or shine, hot or cold. This is strictly required since a drowning accident happened. When you get on a boat and wait for the tour to start, do not hold the frame around the boat. You may get your fingers caught in floating boats while they are hitting by waves. It is of cause OK to hold the frame tight once the tour began. The plastic sheet provided around the boat is to prevent water coming in. The customers are supposed to use it when the boat reaches rough streams. 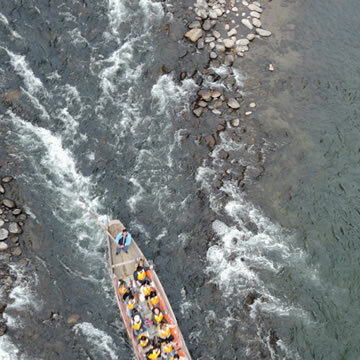 Since the improper use of the sheet brings opposite effect and water will flood into the boat, the Sendo-san (boat operator) may let customers try using it when the tour starts. Customers need to use the sheet altogether, in cooperation, in synchronization, another Japanese custom you may experience. For your information, customers who sit in front usually get wet even if using the plastic sheet. The splashing is so welcomed in hot summer, but remember you may get wet much more than you expect. Watch out for your camera or mobile phone. At the end point of the boat tour, a bus is often served to go back to the starting point. The starting point of Kawa-kudari is often located near train/bus station. Kawa-kurari operating company offers a bus service between the end and the starting point for those wanting to go back to the point of departure to take a public transport service nearby. The fare is usually for free, but make sure when you use the service. There are items you are not allowed to bring on the boat, such as large luggage (suitcase) and bags troubled after wet. You cannot leave such luggage at the office at the starting point. In this case, ask the Kawa-kudari operating company to bring them by bus to the end point for you (with a fee, usually 100 JPY or so), or use a coin-operated locker at the nearby station, or ask your hotel to keep them. Kawa-kudari operating company monitors the river / the weather conditions and they may cancel their services for safety reasons. Even if it is sunny at the Kawa-kudari site, the chances are that it is heavily raining in the mountain, that causes a flash flood in valleys. It is better to check online as the Kawa-kudari company updates operation schedule on their website. Kawa-kuradi is usually available for those not having booked, but it may be better booking beforehand as reserved customers can take a tour on schedule without waiting. For groups of 10 people or more, prior booking is always required.